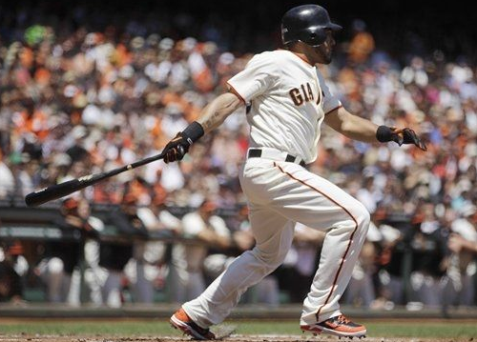 Major League Baseball announced yesterday it would be suspending San Francisco Giants’ outfielder and All-Star Game MVP Melky Cabrera for 50 games following his testing positive for the performance-enhancing substance testosterone. The news will be all over television screens, newspapers, and the minds of baseball reporters, fans, and executives—for a day or two at least. But with Cabrera in the midst of a career year and eligible for free agency this offseason, it could well haunt him for the rest of his life. Cabrera is hitting .346 with 11 home runs, 60 RBI, 13 stolen bases, and a league-leading 159 hits for the Giants this season, his first in San Francisco. He came to the team from Kansas City after being traded for left-handed pitcher Jonathan Sanchez in November and quickly signed a one-year, $6 million deal to avoid arbitration. Cabrera enjoyed similar success playing for the Royals in 2011, hitting .305 with 18 home runs, 87 RBI, and 20 stolen bases. In the prime of his career at age 28 and coming off two great seasons at the dish, Cabrera was sure to receive a multi-year, big money contract this winter. The failed drug test and suspension will change that. The statistical surge in his breakout season last year came in large part as a result of increased power numbers. Along with career highs in home runs (18) and OPS (.809), Cabrera hit 44 doubles, 16 more than his previous best. It’s impossible to measure what effect his use of testosterone had on those numbers, and even more difficult when it comes to its impact on his even more dramatic spike in batting average. It’s hard to argue that being bigger or stronger helps put the bat on the ball. Nonetheless, teams in need of a good hitter this offseason will be deservedly wary of giving a long-term contract to a player whose output may (or may not) have been significantly affected by his violating the sport’s drug policy. Before this development, Cabrera might have been looking at a deal along the lines of those signed by (the arguably overpaid) Torii Hunter (five years, $90 million) or (the definitely overpaid) Aaron Rowand (five years, $60 million). But his current prospects will be closer to a few other outfielders on the list of players suspended for using performance-enhancing drugs. Namely Mike Cameron, Jose Guillen, and Manny Ramirez. It’s important to note that none of the players on the list of PED suspensions has ever signed anything longer than a two-year contract after failing a drug test. Most had to play it one year at a time for the rest of their careers, as teams were unwilling to grant them anything long-term both for PR reasons and the aforementioned suspicion that their stats would shrink absent the drugs. By failing this drug test the Melk Man has gone from being a name close to the top of every team’s letter to Santa to one who will be lucky to have more than a team or two willing to take a short-term flyer on him in the hopes that he can sustain his production. When things are all said and done, this one failed drug test could end up costing Cabrera more than $60 to 70 million and a whole lot of the peace of mind that comes from knowing where your next paycheck’s coming from. And hey, that’s just the effects it’ll have on Cabrera and his wallet. Let’s not forget that baseball is a team sport, and that the 50 game suspension comes at a time when the 64-54 Giants are just one game behind the Dodgers in the NL West and deep in the midst of a playoff (and maybe even pennant) run. But the team only has 44 games left in the season, meaning Cabrera will also miss the play-in game should the Giants capture a wild card spot and at least part of their division series (if they make it that far) regardless of the nature of their playoff berth. That is, assuming they get one at all without Cabrera, who has been a large, but ultimately indefinable part of the team’s success. One thing is certain, the San Francisco front office comes off looking like a bunch of future-telling baseball geniuses, as the team traded for Hunter Pence in July. Without Pence, the team would be left with an incredibly shallow outfield. I mean, they were already shallow back there in the grass, that’s why they were willing to let go of Tommy Joseph, one of their top two or three prospects to get Pence in the first place. Before I sign off, I’d like to note one more thing. As soon as the report of his failed drug test was released, Cabrera released a statement through the players’ union to apologize and admit his mistake, saying, “My positive test was the result of my use of a substance I should not have used. I accept my suspension under the Joint Drug Program and I will try to move on with my life. I am deeply sorry for my mistake and I apologize to my teammates, to the San Francisco Giants organization and to the fans for letting them down.” Whether his words and regret are genuine or not, at the very least, Melky didn’t make excuses or try to hide behind lawyers, his union, or an appeals process. For that at least, I give him credit. those who placed their trust in him. No, I am not sad for Melky Cabrera, his eyes were wide open.